In addition to its many beautiful beaches, stunning waterfalls and rustic villages, Sri Lanka’s temples are some of the most interesting and indeed, most important places to visit on this little Lankan island. Suffice to say, no visit to Sri Lanka is complete without at least checking out the serene and rich in history- the temples on the island. Kandy, one of Sri Lanka’s central islands, has its own unique style of architecture, Buddhism, art, music, rituals, and spirituality. The Three Temple Loop perhaps draws significant attention nestling in Gampola. ‘The Three Temple Loop’ is named after the three temples Embekke, Lankathilake and Gadaladeniya situated in close proximity to each other just a few steps away. Embekke, Lankathilake and Gadaladeniya are three of the most ancient and legendary temples in the central highlands. The temples serve living testimony to Sri Lanka’s Buddhist heritage, history and exceptional craftsmanship. Each temple holds a considerable amount of historical information of the ancient kingdom’s era, carved mostly in stone. Embekke is famous for the intricately carved wooden pillars of its digge, or drum hall. An artistic creation in the fourteenth centuryEmbekke Devale was built by King Wickremabahu III. The temple is an audience hall for guardian deity of Sri Lankan Buddhism also known as Kataragama Deviyo. The temple in the form of a hall way has elaborated wooden sculptures in all its pillars. Each pillar had a different pattern carved into each of its four sides.Wrestlers, stick dancers, warriors, battles between elephants and lions, dragons, peacocks and flowers are some of the incorporated artistic choices. Amongst them the most favorite of all visitors is a strange sculpturing of a hybrid of a bull and an elephant. The wooden craftsmanship of Embekke devale is absolutely interesting and could mind boggle you at the same time. The majestic, imposing structure of Lankathilake Vihare,is believed to be one of the most magnificent architectural edifices in the Gampola kingdom. It nestles one kilometer away from Embekke on a large stone outcrop. The Lankathilake was built at the crest of a large rock named Panhalgala overlooking the Hantane mountain range in the Hiripitiya hamlet in Udunuwara. 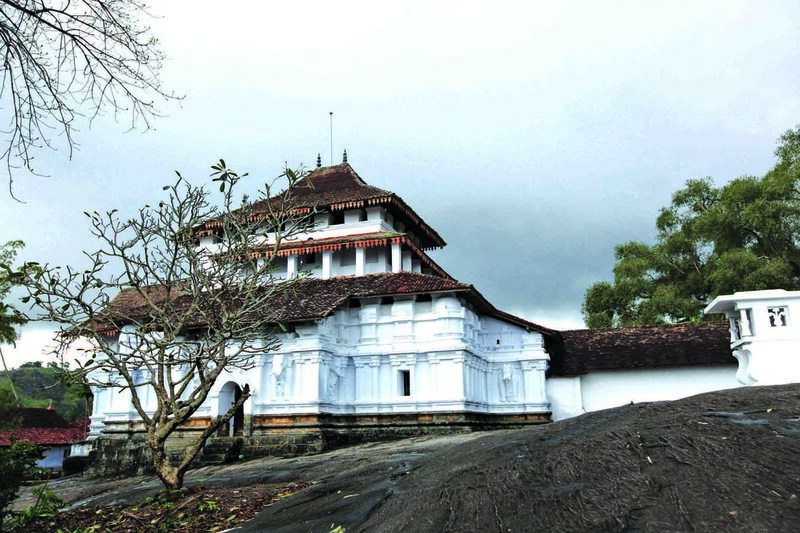 Coming in to full form in 1344 the Lankathilake temple relives the memory of Pollonaruwa era. It blends wood, plaster and stone in an architecture to resonate this era. For historians, the temple is a sight to behold for its ancient paintings and the temple itself as a whole is whitewashed with numerous sweeping roofs and incredible in its solidity and powerful structure. 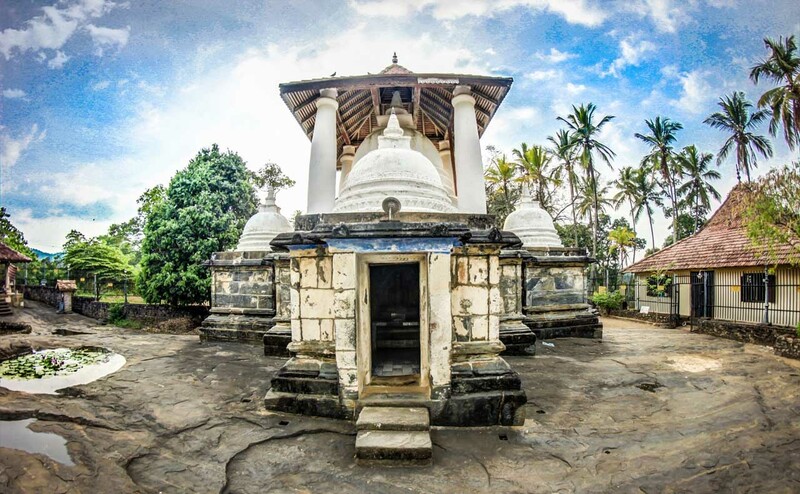 An old monastery and a historical marvel Gadaladeniya Temple in Sri Lanka is a must see attraction among the ‘Three Temple Loop’ and it is the last temple in the loop. According to an inscription in the Gadaladeniya Temple, this temple was built by King Buwanekabahu IV in the year 1344. The chief architect of this temple is known to be a South Indian called Ganesvarachari, and perhaps the temple is essentially a South Indian design. The Gadaladeniya temple is built almost exclusively in stone, nestling on a hilltop with complementing extraordinary serene views of the country side. If you could perhaps accommodate a local guide to decipher the symbolism of the many carvings in these temples it would be rather easier to understand and comprehend the story behind all the mind boggling craftsmanship. Early starts in the mornings are best to avoid hot stone stairways when you walk barefoot. It is advisable to carry or leave your Footwear like sandals or flip flops in your transport or nearby and, not to be worn inside the temple premises. Yes, we all know that dress code for temples are pretty conservative and we hope you respect these religious and conservative choices. For ladies, a rather long shawl perhaps would suffice. And of course to avoid sunburn, it is better of you could bring your shades, a cap and be in comfortable clothing as you walk through the three temple loop. And yes, this experience is rather private unless and of course you bump in at the same time with another group of visitors or local worshipers. The Three Temple Loop is nothing but a journey through a tranquil setting, where ancient history comes to life through art and architecture. It is a ground where religion, history and architecture intersects. Join us @www.bluelankatours.com for your exclusive tailor made tours, to enjoy the serenity of The Three Temple Loop.